As the timey-wimey tradition of guessing who the next doctor on Doctor Who might be commences — we’ll miss you, Peter Capaldi, you had a great run — tenth Doctor David Tennant has decided to weigh in on whom he believes the next leading Time Lord should be. So don’t blink when we tell you he thinks his Broadchurch co-star Olivia Colman should be at the top of the list. Keep your eyes open! “Olivia would clearly be a magnificent choice,” Tennant told The World of One. 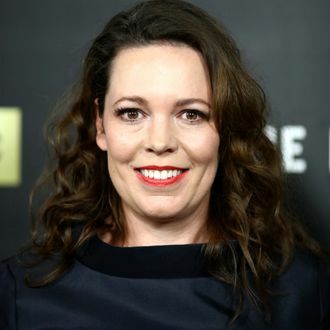 “If you have the right people telling the right stories then it’s absolutely a possibility.” Colman recently won a Golden Globe for her performance in The Night Manager, and she’s starred in quite a few popular shows across the pond including Broadchurch, Peep Show, and Fleabag. While it’s certainly a bit too early to expect the BBC to name an immediate Doctor replacement — Capaldi’s last season hasn’t even yet begun airing — prominent British bookmakers have already begun putting odds on who will be cast in the role next. And apparently, they agree that it might be time for the first woman Doctor: Colman is currently topping the list by a decent margin of 8-1 odds, followed by Richard Ayoade, James Norton, Reece Shearsmith, and Ben Whishaw.